Get a three-ring binder (1-1/2″ works well) and a three-hole punch. Now you’re all set for compiling your very own cookbook. If you want to spend a little extra money, get some page protector sheets so you can slide your recipes right in without punching holes. I’m a messy cook and usually spill an ingredient or two on my pages so this is a must have for me! To take it a step further, get some dividers and organize the recipes by course. If you love dessert as much as I do, you might need a binder for desserts alone! If you want to get just a bit fancier, you can buy a binder made especially for compiling your recipes. Most of the recipe sites that you will visit online give you the option of printing a recipe on a full page or the size of a recipe card. 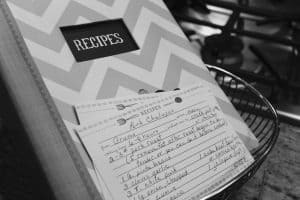 With this nice feature, you can save yourself the time and effort of handwriting recipes on recipe cards and they will fit nicely in these binders. Check out these recipe organizers that I found on Amazon. I received one as a gift years ago and managed to fill it up very fast! You may not have aspirations of writing cookbooks for the masses but all of your testing, trial and error and success should be chronicled. It is hard work to eat well with food allergies! People create memory books for the big events and important people in their lives all of the time. Figuring out what to eat when you have food allergies is a big deal, too (especially if you are dealing with multiple food allergies). Create your very own personal cookbook with all your family’s favorite recipes at TasteBook.com. You can choose from thousands of recipes from their collections but, even better, you can add your own recipes AND your own pictures. What a great way to celebrate what you can eat when you’re eating with food allergies instead of focusing on what you can’t.